Improve your marketing readership, audience engagement and customer sales conversions. Why look at multiple headlines? 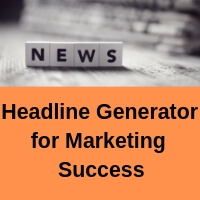 A headline can attract an audience to read further. Show how your content will help your niche audience to engage them. Build your readership, prospect list and eventual customer list. Use powerful headings in advertising for improved customer conversion rates which also save you money. Poor headlines lose you money as your content is skipped over. Consider keywords that your audience will understand. Select the headline results from the above text area. Ctrl A = Select All, Ctrl C = Copy, Ctrl V = Paste. Use this text in web page titles, article headings, post headings, meta descriptions, secondary headings etc.